DEEP - HIDDEN - ENORMOUS CHAMBERS DEEP UNDER GIZA? Preface: the author here claims that a unknown, secret entrance to the great pyramid was at last found on the basis of instructions and "intricate codes" - found in a type of underearth tomb in 1936. These code-findings were east of Athena but the "statements" was not correct decoded until many years later he claims. Yes - it was not before june-76 that a small group was able to enter these enormous underground chambers lying deep under the pyramids on Giza. They claim to have taken thousands of microfilms of what they found - things that proves far distant ET-visitations, underground civilizations and far developed societies on earth. It may seem as a fantastic claim or a big bluff - but remember that if this should be true - the conservative scientific society and the might-powers in position - would do all to hide or stop these things from being revealed. This is not groundless claims - because the now released reports from "the disclosure project" - shows very clear what the men in power has so well covered and denied ET-visitations and similar the last 60 years or more. Their might would weaken a lot - if proven discoveries would show that "god" did not make/create earth - and humans, as said literally in the bible, some few millenniums ago. Another thing to remark, like some spiritual sources say - is that so-called evidence - that is too convincing - is not allowed to come forth from the spiritual "controlplane"!! BECAUSE EVIDENCE IS SOMETHING THE RIPE SEEKER MUST AND WILL RECOGNIZE INSIDE HIM/HERSELF when he/she is mature. Therefore it is to consider, that like in this case, "the society" was not yet mature for this to come forth - until time is right. It is also interesting that other sources as Lobsang Rampa and some physical ET- contactpersons, told similar things that the claims here says. (Some words are translated and some headlines added. There may be wordmistakes - as text is scanned). "This unusual venture into these secret chambers was costly, not only in a monetary aspect, but in the four lives that were lost in the few short years that followed the expedition - due to this entry and the information gained. Although nothing was removed from these chambers, the microfilms have since proven to be a priceless entity to those who place money in a higher regard than human life. It is entirely doubtful now that these microfilm clips will ever be displayed for the general public and will remain as guarded as the spacecraft now in captivity at our Air Force Base. "The records within this tomb are as near endless as time itself and had all these discs and plates been photographed, instead of the mere 2,700 that were taken, we may now have been able to conquer the many fears that befall every man. We may have gained enough basic knowledge to now prolong our total demise, changed the lifestyle of all those on earth, prevented the massive starvation now engulfing the world, found cures for cancer and other ills that plague mankind and eventual accomplished a new race of greedless people. Had we dug deeper with more photographs, we may have discovered the secret of the anti-gravitational machine, perfected the laser for our new and improved society, accomplished terrestrial travel, produced tiny wafers that would supply a multitude with the proper nutrition thus preventing hunger among the needy, and last but far from least, we may have found a sound use for telekinesis and teleportation. What you have read in these preceding pages is not only the basic truths of the expedition, but only a brief scanning of the overall data retrieved. Since our Pyramid is evidence of our past - and can never be duplicated, we can actually say that Noah's Ark, the UFO's and Atlantis fit this same category of the higher technologies of the once advanced civilizations who inhabited our earth. Therefore, if these basic truths are now visible, how could one deny the contents of this tomb or the fact that such a tomb exists. It is not all that difficult to imagine the technologies of our ancients - in a comparison to ours. Their advancement was based on supreme knowledge handed down for millions of years - while our advancement is based on the bodies we must tramp upon to gain just a minor degree of advancement. Just weeks prior to this expedition's discovery of the hidden entrance on the outer shell of the Pyramid, a caravan of scientists from a California University had just completed their external examination of this structure, using a cosmic and gamma x-ray device to determine whether or not Gizeh was hiding any secret passages or rooms that were undetected from the internal viewing. when these rays were focused on the Pyramid, any solid portion would immediately bounce these rays back, or be delayed should any inner opening absorb the rays longer than necessary. This examination did reveal the obvious delays for its normal inner passageways and its well-known chambers. What they did not know was the absorption of split seconds (millionth of a second) that actually indicated a secret stairway running directly behind the King's and Queen's Chamber, for here we are speaking of a large opening with only a 29 inch (74cm)passageway directly in line with these x-rays. Such a narrow passage could obviously be missed and below these Chambers, the structural casing was entirely too thick to emit such rays as far in as this staircase was located. Thus this University experimental examination revealed nothing more than the usual inner openings and no inner passages. 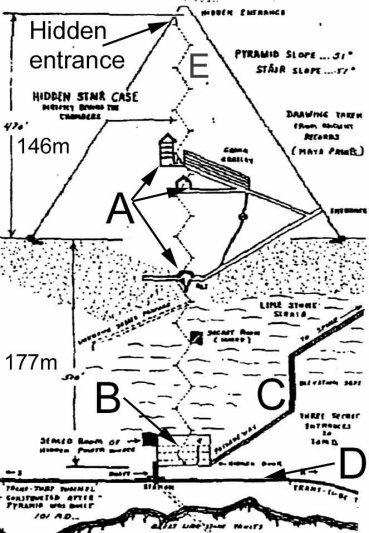 However, a select few people of this expedition (including this author) were well aware of a secret entrance and some sort of an inner passageway that up to that date in June 1976 had escaped detection from those who scanned its surfaces with the finest of instruments. As I indicated in this book's introduction, the entrance was only discovered after forty years of intensified research, mishaps, trials and errors and the interference by the Egyptian government officials. In entering the Pyramid through this secret passage, one must accept the fact that if anyone were discovered during this process, either by the Egyptian officials or the guards of the grounds, imprisonment or execution would be the immediate order of the day with no amnesty for those who participated in such an atrocity against that government. To re-brief you of the secret entrances to the subterranean chambers, there are two unknown routes (now known to all who read this documentation). One such entrance is located near the top of the Pyramid where magnetic forces play a major role in the actual door opening, (exact location to be withheld) and the other being an under the base of the hidden tomb, or Chamber of records. The exact entrance to the Temple of the Sphinx has also remained a wellguarded secret, although after 10,978 years, it is now known to a select few. This Temple is a shrine of extreme beauty with its breathtaking splendor of gold inlays with sprays of precious jewels at the secret altar, arches of unusual architecture, highly polished marble walls of a pinkish tint and pure silver floor inlays of unusual hieroglyphics. Somewhere on the maze of marble walls and abutments, lay a secret door and a downward passage to the tomb beneath the Pyramid of Gizeh. Today, both the Pyramid and the Sphinx are heavily guarded by a 24-hour vigil of armed Egyptians - and tourists tread a thin line around and within a structure. To enter from the top of the Pyramid's secret entrance, one must be directly in front of a specific stone yet having ample room to maneuver if and when success was reached this one and this particular stone began to move. When two of the men were ready with the key words and a belief they had the proper vibrational tones, no one was sure how such a stone would move - if at all. For the few skeptics that are inherited in every group, the movement of one of these stones was not only impossible and impractical but also totally unheard of in any scientific theory. Thus they were certain that the 40 years devoted to this research was in reality a hoax of some ancient who devised a scheme to thrill those who sought out the meaning of those scrolls, originally discovered just outside Athens, Greece in 1936. Although all members of this expedition supported some feelings of truth to those informative scrolls, still to a degree leaned toward traces of skepticism in their deep beliefs. Before an actual attempt could be made in trying out various verbal vibrations, much preparation had to be taken under consideration. Research had to be done to clock the rounds of the parading guards, when they were relieved and when, if at all, did they discontinue their vigil (nattevåkning) of the Pyramid's exterior. It was recorded that each group of eight guards changed hands every four hours and were clocked for duty from 6 A.M. to their final dismissal at 6 P.M. This was a twelve-hour shift and since all tourists had to vacate the Pyramid by 4:30 P.M., their last shift closed at the end of the twelve-hour interval. Due to delays of various guardsmen, no move could be anticipated before 8 P.M. The one remaining guard at the Pyramid's entrance presented no problem, since his position was at the opposite facing to the secret entrance of the south wall. The first date for this unusual venture was scheduled for March 5,1976 when the moon shed no light and would remain for four hours. The first attempt was futile (fågjeves)and to the discouragement of the eleven who were on this private expedition, many more futile nights followed in rapid succession until exhaustion set in after their attempt of the 20th try. Many trips to the height of 450 feet were made regardless of the moon reflections, for inasmuch as they were never spotted; their attempts became bolder (dristigere)with each intended climb, and toward their last visits. There was little or no fear of being caught. A total of 37 attempts were made in this series of trial and error. On each trip, generally involving six members of the eleven, the key words were uttered in many verbal tone vibrations, yet they failed to get any response to an opening of the stone. After the third dozen attempts, frustration and more sincere skepticism began to seep in with all other mixed emotions. This repeated climbing finally took its toll among the members of the crew and in the last few attempts the number in the party dwindled to just three scouts who were of a diehard makeup that would not quit. This climbing exhibition lasted from March 5th to June 6th before there was any inward feeling of success. It was the early hours of morning of June 7,1976 that, in the silent of the night, something was heard in the direction of this one particular stone. Searchlight involving only a piercing beam (and not a flood of light for obvious reasons) showed only tiny specks of loose cement at both its vertical edges - but nothing more. Since we knew every inch and degree of inches around that one stone, it was immediately apparent that this tiny debris was not there when the arrival was made. Some movement must have taken place and something created a strange sound. Other than these two unusual happenings, that evening of the seventh was totally uneventful. It was not until the wee morning hours of June 9th (June 7th by the Lunar calculation) that success was achieved, and by mere accident. Our voice recorder (of tone vibrations) was turned on accidentally when Amend Abouu stooped over to step down and begin to make an exit. Results occurred immediately. This 15 ton block began to slide inward at a slow pace, creating with its movement a sound of stone rolling over pebbles, yet not really this type sound. The precise time was seven minutes past the fourteenth hour of midday (fourteen and seven is 21) or seven minutes after 2 A.M. of the 9th of June. Apparently, as we reasoned later, the time divisible by seven of the exact day plus the correct tone vibration of the key words led to the secret of the opening. The stone block rolled (or slid) inward for a distance of not more than seven feet, leaving only a clearing of a mere three feet (90cm)due to the block protrusion of the under layers. Instead of jumping at the chance to dash into the opening, hesitation was the theme of the next few seconds - due mainly to shock and total surprise. The decision was finally reached (and none too soon) and the three scouts hurriedly climbed down its pitch-black mouth and just as the right hand of the third member was pulled free into the opening, the giant block slid smoothly over the underlay stone. The total time of opening and closing totaled just 35 seconds with 49 seconds to its final resting place on the exterior facing. 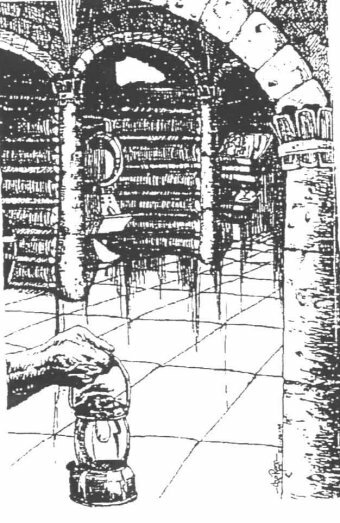 On entering, the lead scout, Amend Abouu had made a misstep in the dark passage and plunged (stupe)forward down a flight of a dozen stairs. By the tone of his voice one would imagine he had been seriously hurt but as it turned out, it was only his pride that suffered the agony - and the dust that was suddenly stirred created a choking experience, delaying the descent for many minutes. This opening of the stone simply did not occur after just 37 attempts from the first initial try but was tried many dozens of times prior to being at that location. 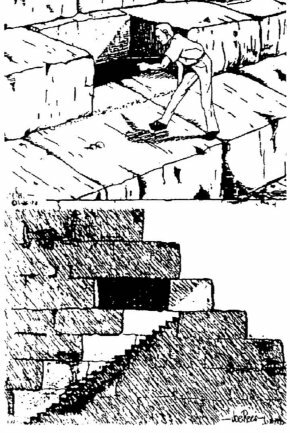 Figure 14: (Top) Entering the Pyramid; (Bottom) The staircase into the tomb. Eight months prior to June 9th, a mockup of this area was reproduced - Hollywood style - in a secluded (bortgjemt)area south of the Pyramid to the exactness of duplication. Knowing, after all research was completed, the men that would enter would have limited time - thus this mockup, on a timer, served as a proper evaluation to learn of the fastest way in, jumping, sliding or squeezing in the allotted time and to determine, after practice, how many it would admit before the last few inches closed around them. Had this not been tried many times over, the first attempt could have been fatal for one or more. In the finalization, it was learned that time, if pushed for every second, could admit four men almost without mishap and if any member displayed no hesitation, which was the case on the first real attempt. Still, with all this practice, no member of the team planned to carry food or water and the first entering consisted of flashlights only - which was a grave mistake. Once this stone closed, the three expeditionists had been completely devoured ("slukt")by the Pyramid, leaving those who were only half watching at the base in complete wonderment as to how the three disappeared from plain sight -who minutes before, could be seen at the edge of the shadows. For those who did not actually see this disappearance still had a premonition it had to be so and they had succeeded. The vigil (våkningen)of the wait seemed endless for no one knew if or when the scouts would return to the exterior of that south facing of the Pyramid. The great stone block had now completed its 49-second cycle and the chosen three were entrapped within the Pyramid's secret passage, not actually knowing what they had done, why they had done this, and where such a narrow staircase would lead. They also had the sudden realization they had no food, water, extra batteries or the smallest of first aid kits for arising emergencies. To prevent a creeping illness of their conscious mind, all of these thoughts had to be immediately dismissed and since they were now entrapped on this inner staircase, there was only one choice and one direction. These three entertained verbally what they were thinking which led them to expound on the idea that perhaps this stone would not open again by the same verbal tone and especially from the reverse position. They did envision the possibility of being sealed up forever and a day and the fruits of their labor being in vain. Here, on this darkened and dust filled staircase, they wondered if these 40 years of research would pay off and would they be the benefactors of this unknown discovery. The passage chamber was narrow, steep and the walls were of jagged cut stone. One wrong move against the sides could cut a man as quickly as that of coral rock - and be even more infectious with the excessive dust, mildew (mugg)and a germ count ranging into the trillions. Once inside they knew what was so desperately needed to continue such a journey. For one thing, a flask of bourbon would help wash the dust from their mouths; additional batteries; candy bars for extra energy, water, a camera and search lights that could pierce the constant dust clouds. Nearly an hour passed at the top of these stairs with each taking his turn examining this unusual sliding stone. From all that could be learned, this block was not mechanical per se. There were no tracks, hydraulic plungers, wheels, chains, rope, electrical wiring or magnetic force, visible or non-visible. There was no way anyone could detect the means of this movement. The only unusual finding, and this was almost impossible to determine due to the position the men were in and the cramped space, was one groove cut in the center bottom of the stone. If there was some sort of an under carriage, it could not be detected. As far as the possibility of electronic devices were concerned, this too could not be ruled out for it could have been hidden at some inner portion behind the second terrace (rekke) in. Therefore, its operation remains a mystery to this day. Looking at this situation on a scientific basis, many secrets of our ancient past remain a well guarded secret and these people, who once inhabited a continent of great technologies, did know the intricate details of unusual electronics, teleportation, thermonuclear energy, liquid light power (without the use of electricity), the unseen power of mercury and the art of levitation through sound vibrations. With this firmly planted within your mind, such a sliding stone remains a deep and darkened secret but if explained, it would become simple facts of scientific logic. Once you have entered through the opening created by this sliding stone block, you stand in pitch-blackness and observe a silence that is unmatched by a normal or abnormal circumstance. Once you have become adjusted to such a strange experience and know you are entombed, perhaps forever, your first reaction is a desperate and panic-stricken urge to get out, breathe fresh air and leave this imprisoning seclusion to another generation. During that first hour of examining the inner side of the block, the verbal key words and the Identical tonepitch were used over and over but to no avail. Such an experience to anyone would create an inward fear that once there, there was no return to the outside world. In such a darkness, even with the aid of three flash lights, you are immediately struck by an intense claustrophobia which is only matched by the pungent odors of mildew(bittter lukt av mugg), slime and a near-choking dust formation, that when disturbed, floats around you in billowing clouds that tend to close off whatever air there might be left to breathe. This point of entry was not too far from the built in air shafts of the Pyramid and an airway had to inwardly extend to this stairway, for if this were not the case, life could not have been sustained longer than the amount of air admitted when the opening was created. Even though no trace of air movement could be detected, there was air, but not of the freshest of scents(lukt). It was breathable only when the dust clouds were kept at an absolute minimum, which was totally impossible. At this point, of even a short confinement (innesperring), you begin to entertain thoughts that no hidden tomb could be worth such an effort and sacrifice of one's initiative and if the bottom of this stair case did lead to a tomb as indicated on those found scrolls, it just might be empty of these historical documents, for if we found such an opening, surely others before us could have done the very same - and this expedition could be in vain with three lives lost until some posterity (ettertid)of the advanced future. Your second thoughts become an even greater reality when the flashes of light reveal the sheer narrowness of the passage, the steep descent and the jagged walls of the limestone. These stairs formed a rectangular design over a large area within the core of the Pyramid and carried you to a depth of approximately 980 feet (also divisible by the magical seven) from the point of entry, which was located 470 feet above the ground. This crudely cut passageway only measured a scant (knapt) 29 inches in width with a headroom barely more than six feet. Each complete set of stairs contained 57 steps and at the end of the 57th, a small platform was provided and against the outer wall, one scant slab (plate-)bench, barely large enough to seat one thin man. Why these stabs were provided remains a mystery for surely they were not designed as a resting-place in an area where no one was ever expected to travel. The only scientific value it could have had was some sort of an inner support or it had something to do with the original construction of such a passageway. The journey down was more treacherous than anticipated with each step creating a bellowing of settled dust that had to measure several inches thick on each tread(trinn). Between each minor dust storm, the pungent odors of mildew, slime cover treads beneath the dust, and stale air, the journey was a hazardous one. The main fear was the possibility of choking by the dust and slipping on the stair edges. The protruded (fremstikkende)slabs did provide some aid at interval steps but was only adaptable for one man at a time while the other stood on the inadequately ledged (avsats)platform. Water to wash down the dust in their throats would have been worth all of the gold at Fort Knox and it was a matter of concern if such a descent was to be completed, with its depth and destination totally unknown. The thought that originally crossed two of the minds in the beginning was the possible fact that this descent was not of any great distance and perhaps in the translation, it could have been a tomb room just opposite the King's Chamber. Thirst could not be satisfied by the sipping of bourbon, for if so, and one sipped more than he should, the effects of the liquor could have created disastrous results with a simple fall on the staircase. If a fall and injury occurred, it may take days or even weeks to get out of this devil's den and a serious injury could be fatal without any medical aid, water or food. Therefore, this descent was one of extreme caution and as a matter of record, each step with the wait for the dust to resettle took more than three minutes. This downward journey into the abyss of who knew where, was one bad experience in which they was hopeful of never occurring again. This descent took more than ten hours and an even greater apprehension was that these steps had to be retraced back to the secret opening. The climb down put these three scouts in such a complete state of exhaustion, by the time they reached the bottom, they had neither the intent nor desire to ever attempt the climb back up -ever. At the bottom of this winding and jagged staircase 10 hours later (which could only be described as extremely treacherous (farlig)and a death defying attempt on one's life), they came to a small foyer(entre), laden with many inches of dust on its marble smooth floor. This foyer contained one rock bench or a protrusion slab similar to those at each 57th step level, a roughly cut set of walls, an arched ceiling resembling a large half of a barrel shell, and one heavy gauge metal door. This door had no jam, sill or hardware. It was a plain metal door that had all the appearances of sliding upwards in the side grooves provided in the limestone walls. How this was to be opened remained another mystery and none of the three men had the strength to even think or hazard a number of guesses. Fortunately, the thought did arise that such a closure might operate in the same manner as the sliding block at the entrance. A verbal key and tone vibration had to be the only possible answer, for if these key words opened the sliding rock at the top, it should, by the same token(likeledes), open the bottom. Two incredibly long hours passed by with no success using the same words and verbal tone. The recording used had many variations but all had failed their experimental tries. They reverted to the process of even reversing the tape and in doing so, one very slight movement was noticed but if the door actually moved, it could not have been more than a tiny fraction of the inch. Suddenly it occurred to Abouu that since we were now at the opposite end of this passage, the reversal of the words should have been used - in the same tone vibration. Using the words 'Urim,' meaning light or revelation for the main stone, the reversal of this should be injected at this time. Another dozen tries revealed nothing until one member simply mumbled the word Genesis and apparently he struck it correctly. The giant metal door slowly started on its upward movement - to the complete astonishment of all concerned. The sound was that of a motor hum, although there were no visible motors or electricity. Thus if a motorized operation was its only means of movement, it had to be hidden above the door or the coiling of that room or foyer. It was now evident that once inside, this door should re-open by replaying the words that opened the stone at the entrance. If and when they ever reached the top of those stairs, more trials and tribulations could befall them if they were wrong in their theories of reversed words or its re-arrangements of the same. Whatever device these builders used in this construction, the technologies were not only superb but also totally ingenious, regardless of the time era.